As featured in Energy in Buildings & Industry Magazine, MWA Technology’s MD Martin Wardell examines some of the problems with the selection of gas meters for checking and monitoring applications, and suggests some solutions. With the rising cost of gas, extra legislation and the importance of improving gas use efficiencies, there has been a significant increase in the demand for gas meters in building services. Gas utilities follow a rigorous meter selection process and meters are installed by fully trained engineers who have studied gas meters and are qualified to MET 2. As you can see from Fig.1, the preference of gas utilities is to install wherever possible, diaphragm meters which have an excellent turndown ratio and operate accurately without maintenance for over 20 years. Their second choice is to install Rotary Displacement, or RD, meters which do require maintenance. Their third choice is for a turbine meter for flow rates above 160m3/h and where there are no small appliances being used. In the building services industry turbine quantometers seem to be the first choice. Generally, such DN50 meters have a turndown ratio of 20:1. Depending on the brand and model, quantometers can exhibit poor performance at low flow rates and also cause major problems with high pressure drops across the meters at a given flow rate. To install a larger diameter to minimise the pressure drop results in exacerbating the low flow inaccuracy. The downstream outlet pressure of primary meters is generally 21mBar and according to ‘IGEM UP/2 Installation of Gas in Commercial and Industrial Premises’, the maximum allowable pressure drop between the incoming supply and appliance shall be no more than 1mBar. The majority of meters for monitoring and checking gas consumption will be operating at 21mBar. 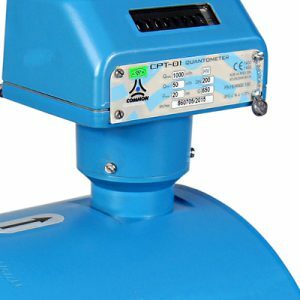 While diaphragm meters for domestic loads of up to 6m3/h are relatively inexpensive, larger diaphragm meters up to G100 DN100 are not only relatively expensive, but also are extremely cumbersome. Rotary PD meters have excellent rangeability but require maintenance. They can be installed directly into vertical and horizontal pipe-runs, but are generally less popular than turbine quantometers. Far too often quantometers are selected by pipe size with little attention being paid to the range of flows that they are required to register. The loads may even be unknown when the meters are installed. Unless care is taken to determine the range of flow rate expected it is often found that larger diameter quantometers are installed in pipework leading to kitchens and laboratories where the diversity of usage is such that the meters often fail to register anything but occasional peak usage. With modulating boilers often operating in sequence, incorrect selection of the meter will lead to significant under-recording of consumption. Far better to install two smaller meters instead of one larger meter! The pressure drop within pipework is critical. Because the pressure drop across a meter rises almost exponentially with increasing flow rate it is vital to specify the range of flow rates to be metered and ensure that meters are selected to meet the lowest possible specified or required pressure drop. Restrictions in pipework such as bends and shut-off valves as well as the pipework also add to the overall pressure drop across the system. We strongly advocate selecting low pressure drop turbine meters with good rangeability such as the Aichi TBX electronic meter, the Aichi AS Series ultrasonic meters, the Itron MZ and Common CPT quantometers. As a good rule of thumb, meters for monitoring should be selected to have less than 0.5mBar pressure drop at the maximum load. MWA Technology are the largest meter stockist in the UK, and our expertise in metering puts us in the perfect position to recommend the right meter for the job. We stock a wide variety of meters from brands big and small, and our unparalleled selection means that we always have the right meter for the right circumstance. Our staff make it their business to know everything there is to know about meters, and our comprehensive service support means that you never have to worry about dealing with anyone else for your metering concerns On top of all this, we offer a 5-year warranty on every meter we specify. You can be confident that our recommended meters are set to last – and you’re covered in the circumstance that they don’t. Get in touch with us today by contacting us online, or calling us on +44(0)121 327 7771.